Most all of the roads on the South Island are very narrow with little or no shoulder on the side of the road. Driving is on the left hand side of the road and if you come from a country where you drive on the right hand side of the road, you have to pay extra attention to be sure you are driving on the correct side of the road. Bicycling is quite popular in New Zealand in the summer time, and with the narrow roads and no shoulders, you have to be extremely careful when passing bicyclists on the roads – especially when its raining (and no the rain doesn’t seem to stop a lot of the bicyclists from riding). Be especially careful when its raining and coming up to a cyclist on a narrow windy road. Even with the above mentioned, driving is relatively easy in New Zealand because the roads are generally empty for very long distances. You can drive for many kilometers in certain parts of the South Island and not see any fences or any homes. This is very refreshing to experience if you have come from a country much more crowded. The maximum speed limit is 100KM/hour on any open road. There are few police outside of the towns, however they are very aggressive near the towns in keeping cars under the speed limit. As opposed to drinking and driving which is a big problem in many countries, “sleeping and driving” appears to be a major problem in New Zealand, if the many bill boards and signs are any indication. There are many dirt roads (called unsealed roads in New Zealand). Most of these are pretty well graded and are ok for the majority of cars. There are certain 4-wheel drive roads but these are mostly marked. Also note that there are *many* one lane bridges even on the major highways. The road signs will tell you which side needs to yield to the other side. Sometimes the very long one lane bridges will have pull outs in the middle of the bridge where you can pull out and let the other car pass you. Other things to be aware of – you need to wait for the green light when turning left. You must be at least 21 years of age to rent a car. The car rental business on New Zealand’s South Island is *very* competitive. Shop around!! 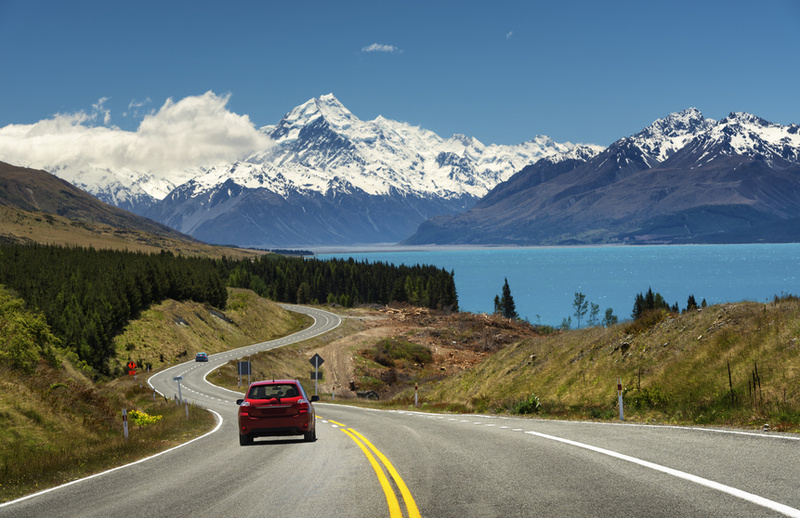 A driver’s license from your home country is fine for renting a car as long as you plan to stay in New Zealand less than 12 months.